£10 Free – When you open your very first Sky Account you will be credited with 2 x £2.20 and 2 x £3.30 tournament tickets to use as entries to tournaments and sit n go’s, you can combine these tickets to enter a tournament of a higher value. Poker points are earned as you play at real money tables at a rate of 10 poker points for every £1 paid in tournament fees and 6 poker points for every £1 contributed in rake. Players have 30 days to release their free bonus money, if you use Neteller or Moneybookers to make your first deposit you are not eligible for this first deposit bonus. Only new accounts holders from the UK and Republic of Ireland can claim this first deposit bonus. 500 Poker Points – On registration you will be awarded 500 poker points to be used to purchase tournament tickets only. These free points do not count towards releasing the first deposit bonus. You’ve probably heard of Sky before as they’re a market leader in the entertainment and gaming industry and have massive offerings including bingo, sports betting and casino games. Their poker arm, launched back in 2007, has quickly become pretty popular especially within the UK. It’s an independent site (i.e. it’s not part of a poker network) and is steadily building up player traffic. 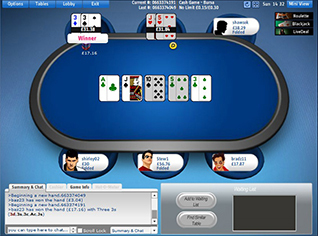 Sky Poker tables run off the Flash player and are subtly decked out in the brand’s blue and white – easy on the eye when you’re playing.There are basically two ‘views’ you can choose from – the standard size table and ‘mini view’. Mini view just strips out some of the graphics (like the table backdrop) and is ideal for multi-tabling. Which, incidentally, is well supported here as you can play up to 24 tables at once. It’s a nice looking poker client which plays well too. However, you can’t customise it other than changing your avatar. As well as playing via the downloadable client, you can opt to use ‘Instant Play’ which gives Mac and Linux users the chance to play poker on Sky too. 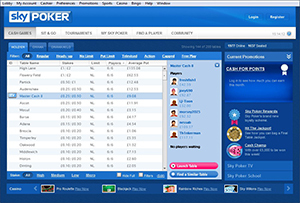 One of Sky Poker’s greatest features is the player Community section. 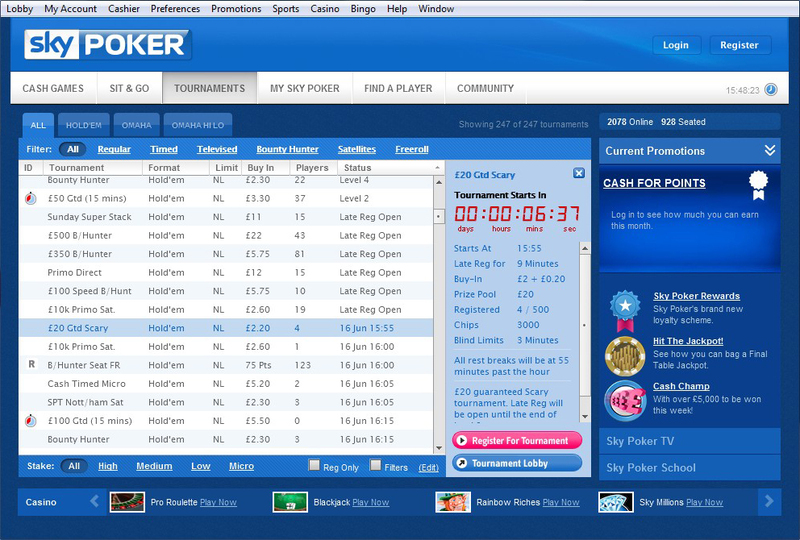 This is a dedicated part of the Sky website where you can engage with your fellow Sky Poker players. There are poker player blogs and, most importantly, a very active player discussion forum where you can trade opinions on poker hands, strategy and news. It’s great being able to ‘meet’ and get to know your opponents but also the forums are a really handy way of improving your play as you can get input from others on specific hands or games you’ve played. The possible downside to playing on Sky Poker is that the vast majority of its player traffic is during evenings and weekend. 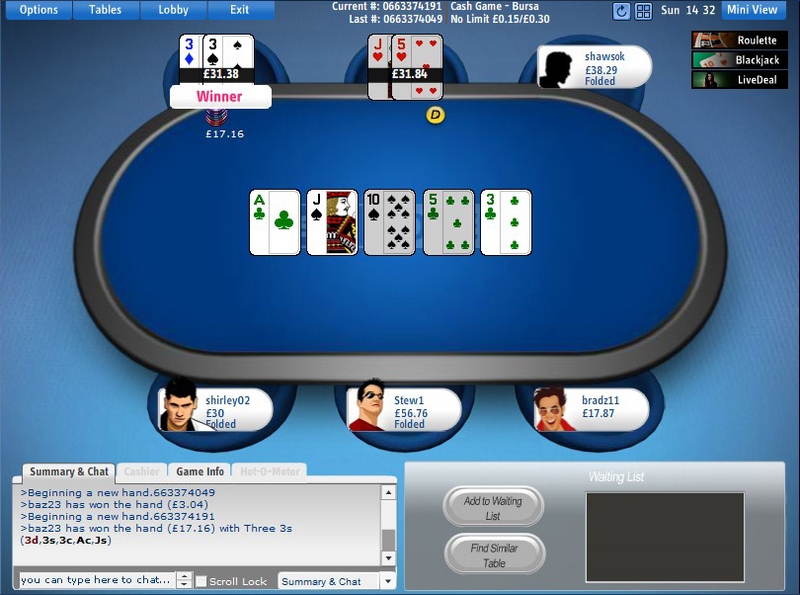 Tables in the daytime, especially for the less popular games such as Omaha, really suffer. That said, the play at busy times is so poor it does make up for it in terms of potential profits that a good player can make. Overall it’s a great site but does have its drawbacks. It’s mainly suitable for micro or low stakes players who want to take advantage of some really soft competition and who are most likely going to be playing at peak European hours. There aren’t loads of freerolls at Sky, but what you do get is a daily £50 guaranteed tournament (buy-in for 25 Points). As you’d expect from freerolls, the play is terrible so they’re fairly easy to cash in. 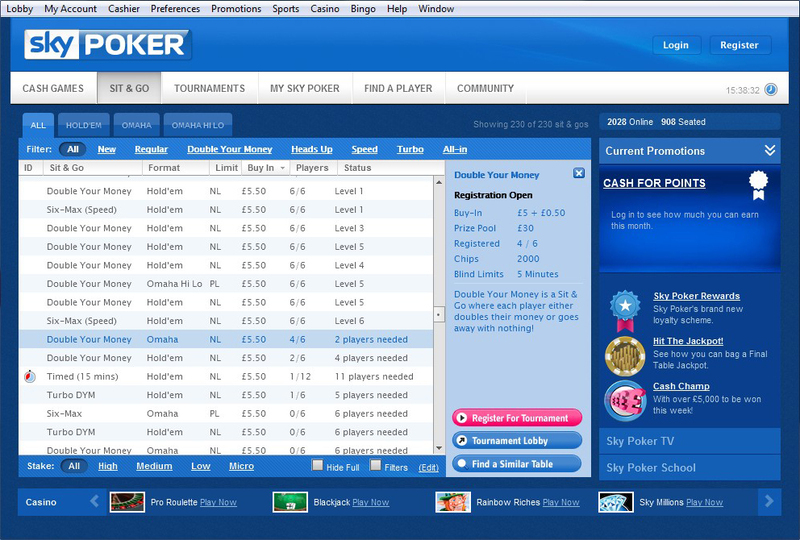 In short, the standard of play at Sky Poker is pretty poor and offers some rich pickings to the decent poker player. As it’s not a huge poker site, the big name professionals and ‘grinders’ aren’t as likely to be on sites like this as they are with PokerStars, Full Tilt etc. Now, there’s good sides and bad sides to this – the good side being that if you can play a decent game, you can rake it in here (no pun intended!) The bad news is that you will need to expect a certain degree of frustration and bad beats as so many players here, especially at the micro-stakes level, will just call off any amount of chips with any two cards pre-flop and then chase any draw or connection post-flop. Standard seats: 2 and 6. Plenty of variety on offer with Sky’s cash games in terms of stakes; formats on offer are Hold’em, Omaha and Omaha Hi/Lo, although the latter two suffer from poor off-peak traffic. Options: Timed, Televised, Bounty Hunter. Tourneys at Sky are heavily geared towards the lower stakes, with plenty of variety and volume at the micro level too. Medium and high stakes are represented, however with far less choice available. Options: Timed, Turbo, Speed, Second Chance, Double Your Money, Heads-up, All In. Games: Texas Holdem, Omaha, Omaha Hi / Lo. 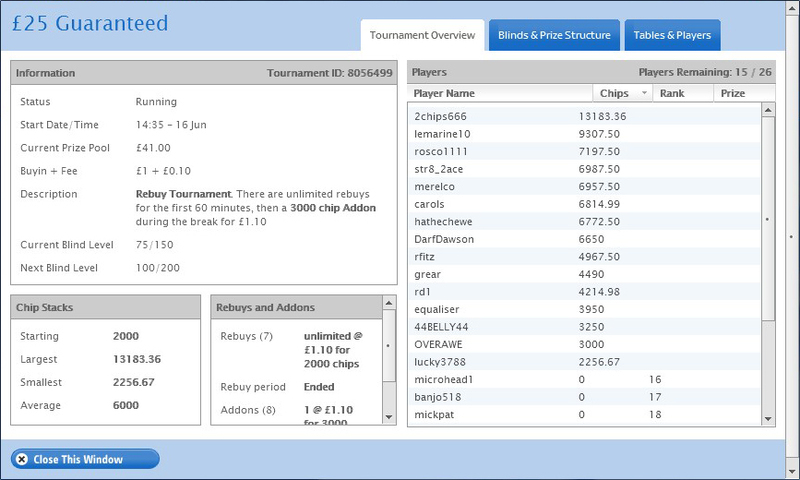 Sit and Go’s are great at Sky Poker for the low-micro stakes poker player. There is plenty of action at these levels but like most of the games on Sky it’s mainly kicking off in the evenings and weekends. There are a decent variety of stakes on offer but mainly centred towards the low-micros. Sky Poker Rewards gives players cash bonuses based on the number of Poker Points earned in the month, each month starts afresh. Go to the My Account Free Bets page or click the Sky Poker Rewards link on the software, enter the code REWARDS and, that’s it, you’ve opted into the Sky Poker Rewards loyalty programme. Sky Poker has the great ‘Team Sky Poker League’ leaderboard. With this, it awards points to players based on their performance in cash, SNG or MTT play. The league runs on a quarterly basis and as well as entry into a freeroll, there are places on ‘Team Sky Poker’ up for grabs for the top six players. When withdrawing funds they usually must go back to the card / e wallet you deposited with, it is possible to change the method of payment from your account with additional documentation to prevent fraud. It usually takes 2 / 5 days for your card account to be credited, within one day if you have used an e wallet. 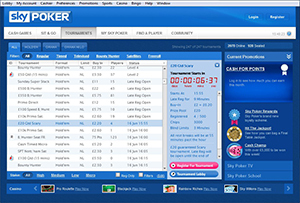 Before contacting Sky Poker take a look at their comprehensive Find an Answer page, you may well find out about what’s bothering you there. Still stuck for a solution? Try their live chat online, phone, email or even write to them at Sky Bet, 2 Wellington Place, Leeds, West Yorkshire, LS1 4AP. UK, Republic of Ireland Only. 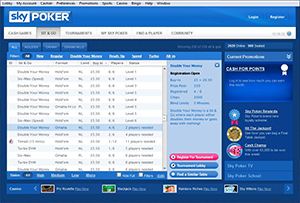 Sky Poker last reviewed by DirectoryOnlinePoker.com April 2019. All rights reserved.